Personally, the most interesting talk at the 90th HealthAchieve Conference in Toronto was Professor Michael E. Porter‘s session on delivering value-based health systems. The above formula is patient-centric right off the bat. The numerator will necessitate incorporating patient reported outcome measures (PROMs) as part of the value measurement (i.e. outcomes that matter to a patient). In this post, I’ll touch up on IPUs and share with you some resources I found online. Porter argues that it is impossible to achieve value with the current way that healthcare structured. 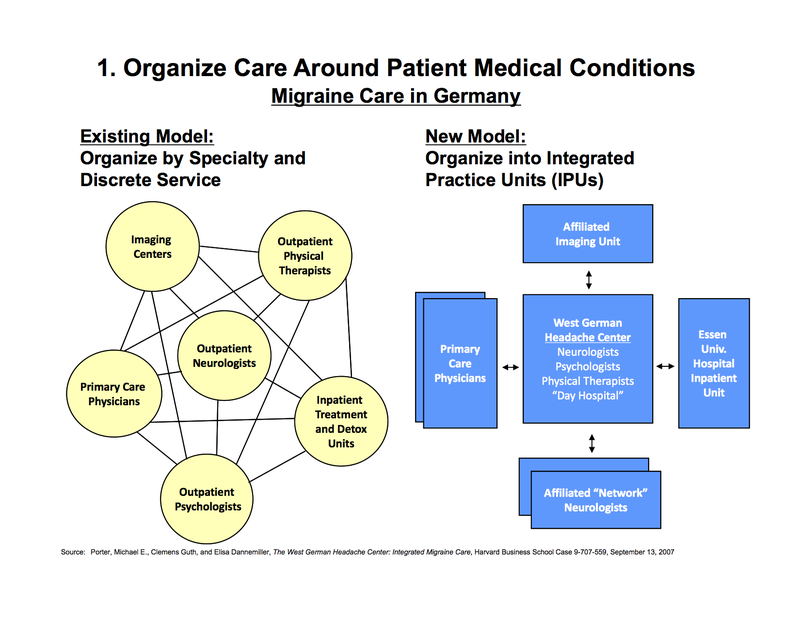 The current model is a matrix-model where patients move from one care setting to the next . He argues that this “ping-pong” approach to providing health care doesn’t lend itself to obtaining value, because it is a sequential process rather than a parallel process. In a sequential model, administrative tasks can become hurdles in delivering “value”. He further argues that this disjointed model doesn’t connect the patient with the right person. What does he mean? Let’s say for example that the condition in question is severe migraines. While neurologists are very skilled in dealing with multiple issues, migraines may not be every clinician’s interest. He argues that getting the right conditions matched with the “interested” clinicians can allow for clinicians and other allied health professionals to develop a high value care delivery model. He argues that the shift needs to move from clinical specialty to condition-based treatment. Also, an IPU would take ownership of the condition across the full cycle of care (inpatient + outpatient). If this is not possible due to limited resources, it can be accomplished by the means of having affiliations with partner-sites that complement provided services, which revolve around the condition and not speciality. Having IPUs in place lends itself to having higher volume of patients, which is a critical component for the possibility of attaining value. Here are some additional articles for your reading pleasure: The Big Idea: How to Solve the Cost Crisis in Health Care & The Strategy That Will Fix Health Care. I also found a recent copy of a slide deck used by Professor Porter. The New York Times’ article – cited by The Globe – raises controversial questions around prospective parents selecting which embryos to implant, and avoid passing down a familial genetic mutation. This is accomplished by producing embryos via in vitro fertilization (IVF), and testing them with a method known as preimplantation genetic diagnosis (PGD). Given my interest in rare genetic mutations, I wanted to further investigate the raised issues and provide an unbiased perspective to the questions. Determining “appropriateness” using disease onset as justification is discriminatory and unjust, because it develops prejudice towards a specific sub-population based on their genetic determinants of health. Complications that arise from genetic disorders – such as GSS – will unequivocally manifest as a function of mutated genes. Even in the context of rare genetic disorders, stating that parents have a “moral duty” and an “obligation” to “spare the next generation” is rather suggestive, and may be interpreted as an endorsement to discard “sick” embryos. Not all couples are aware of carrying a genetic mutation, and affordability is relative. Also, I’m not sure if “the next generation” is in reference to the ‘potential’ child, or society in general. Flicker (2012) argues that if the “best interest of child standard” is the basis to suggest a duty to deselect embryos, then it cannot be applied. As Flicker points out, deselecting “sick” embryos cannot be legally enforced, because the “best interest of child standard” applies to an actual child, and not the potential of an embryo that may develop into one. Discarding embryos based on information from a PGD may be deemed unethical, because a discarded embryo can ‘potentially’ develop into a child therefore requiring protection. A recent publication argues potentiality’s validity using evidence in cell biology. Steir and Schoene-Seifert’s (2013) argue that ‘potentiality’ is “depontentialized” (i.e. rendered useless), because of our ability to convert cells -including humans’- with no potential of developing into an organism, into cells that develop into organisms- such as converting skin cells to develop mice pups. The killing of Lin Jun – allegedly committed by Luka Magnotta – made international headlines. Today, the headlines aren’t about the act, rather they’re about a decision made by the courts to block access to data from a research study that Magnotta had participated in the past. The police tried to access the recorded interview conducted between a researcher and Magnotta, however, Justice Sophie Bourque barred access to the transcripts for use as evidence in his trial. To date, there has been no precedence set in the courts that protects participants’ research data in the case of a murder trial. As a participant, you are assured that your data will not be disclosed/used for purposes other than the study – aka researcher -participant privilege. Was it ethical – albeit a moot point – for the student to contact the police? What’s more interesting is how Justice Bourque dealt with the collected data from the research study. The above statement is a double-edged sword. Although, the Judge’s decision to block access by the police to the data is a monumental decision that protects research participants, it is unethical of her to review the transcripts of the audiotape. There is a clear indication that her decision was influenced by the content of the transcripts… Suppose she deemed it “useful”, the police gain access to the transcripts and use it as evidence in the courts. The Judge’s ability to review the content can have implications for future research. Let’s consider a study that is researching behaviours of individuals who are at high risk of contracting HIV. Hypothetically, if a participant is in a similar situation such as Magnotta, based on today’s precedence, a judge may rule that a participant’s research data made available for the trial. How could this affect the decisions of potential research participants who are at high risk of contracting HIV? One can argue that this will become a concern to potential participants and act as a barrier to quality research. Should a participant partake in a study, their answers may be skewed based on the possibility that their data – if linked back to them – can be used beyond the scope of the study. Another argument can be made that participants who make for ideal study candidates avoid participation due to fear of prosecution, therefore stifling research. Justice Bourque’s decision to review a participant’s data collected in a research study is unethical and violates researcher-participant privileges. The potential harm to conducting sound, quality academic research outweighs the benefits of using research participants’ data as evidence in a trial. Anonymous is bewildered as to why Canadians love their healthcare system. For starters, love is a strong word… Having said that, I for one appreciate that we have a fantastic healthcare system. Is it the best? No. Can it improve? Absolutely. Amongst the plethora of answers, I share with you my answer to Anonymous’s inquiry. While we have a good healthcare system in Canada, unfortunately it is not the best model out there – and I will point out some of its downfalls. Having said that, here are some major reasons why we – at the very least I – love our healthcare system. Philosophy: In Canada, we operate under the philosophy that healthcare – and consequently good health – is a basic Human Right and not a privilege. As such, there should be no barriers to acquiring healthcare services segregating between the rich and the disadvantaged, therefore making it a privilege. So right off the bat, it’s a difference in philosophical thinking. Burden of Cost: While it is true that most care services are provided at no cost to patients, it does not mean that healthcare in Canada is free! The burden of cost has simply shifted from the patient at the point of service to other forms such as: taxation, government subsidies, etc. Health: The concept of health is viewed differently. Health isn’t just about your physiology and how you feel, health encompasses a plethora of determinants. Everything from genetics to socio-economic factors affect health. With that in mind, our approach to healthcare is more comprehensive – at least it should be in theory. Healthy Population: A healthy population is a productive population. A productive population leads to a productive nation. A productive nation yields a rich nation. A rich nation yields a happy population. I’d wager a healthy population is a happy population. Perceptions: The perception that healthcare is “free” is common amongst Canadians. This is largely due to the fact that we don’t part with any money when we acquire healthcare services, and so the typical perception is that it’s “free”. This perception can generate waste in a system. Model: Currently, Canada runs on an acute-care model. This means that we treat problems and illness instead of preventing them, so emergency care. Although we are well aware of point #3 pointed out in pros – there is also evidence in scientific literature – we are oh so SLOW in turning around our system to become a preventative one. The most healthcare dollars are consumed by “end-of-life” patients and chronic illnesses. Some of these VERY expensive treatments – in theory and in practice – can be prevented with early interventions, depending on the illness situation. Examples can be more funding into social services, mental health detection, etc. Centricity: This is somewhat related to con #2. Not only is our healthcare model an acute-care model, it is also a provider-centric model. This comes from years and years of practice in this way. Traditionally, MDs are put on a pedestal because they can cure illnesses, yet in the areas of chronic diseases, the patient becomes the manager of their own health. This is prevalent for patients with rare genetic conditions. Essentially, we need to move towards a more patient-centric model, where the patient is viewed and treated as the “consumer/client” just like in any other industry. There are a lot more arguments for both sides dear Anonymous. For me, the above mentioned pros are why I love our system. And the above mentioned cons are areas that a new generation of patients will challenge, and with time will change – another reason to love the system. I suppose to an outsider, it does seem odd that we are appreciative of our healthcare system. What I find odd is that healthcare is not universal irrespective of citizenship, geography, status, race and any other social construct – aka baggage – that we’ve amassed over the year. We are all human after all, right? Dear eHealth Ontario, come again now? Today, eHealth Ontario issued a RFP titled “Predictive Economic Modelling for EHEALTH Benefits” – Where do I begin? They further elaborate by stating: “submit proposals for a health economics benefit evaluation model and methodology to be used to predict the quantitative benefits of an EHEALTH Ontario clinical program.” – Who wrote this? Let’s start. Which clinical program are they talking about? Is it their Diagnostic Imaging, Drug Profile Viewer, Medication Management System, OLIS or Physician eHealth program? They can’t possibly be asking for a model that will cover ALL of the above programs, are they? Let’s discuss. I’m glad eHealth Ontario is looking for “quantitative benefits” – which I think is great – to see if the numbers make sense, or not. So, what type of “economic model” are they looking for? Is it cost benefit, cost effectiveness or cost utility analyses? What criteria are they looking to quantify? Monetary, productivity or quality adjusted life years? Who’s perspective are they using? Clients, Providers, Government? I’m guessing by “Predictive Economic Modelling for EHEALTH Benefits”, they really mean a Health Economics Evaluation for each of the eHealth projects they have funded to date. I may be wrong, but I do not believe there is a “one size fits all” type of analysis for all their programs. eHealth Ontario is looking to acquire experts to conduct an evaluation analysis – with solid methodology and good data – for informed-decision making, which I think is an absolute must at this stage of the game – OLIS anyone? As a tax paying citizen, I support this endeavour. My perception is that they don’t quite know what they are asking for – although the intention is there – however, I think more direction and organizational clarity is needed… perhaps pilot one program area. Dear RFP requester, sit down with experts and figure out what what you want to measure and what to look for. Here is a great free resource for Health Systems Evidence. Personalized Medicine – Take That Cancer! After a decade of work, these researchers created gene-specific drugs that can inhibit cancer-cell growth. Hopefully it makes it into clinical trials and proves its efficacy. Common Sense – Surprisingly – Prevails! First, you have Fred Horne’s decision. Next, you have the Supreme Court’s ruling on patenting genes. Truly a marvellous day, my faith in humanity is restored. Following my latest post, I reached out to an expert in privacy as well as a primary care physician for some feedback. Below I share with you a “quick ‘n’ dirty” fix – I don’t think this is a good solution – and address some of the concerns and feedback I’ve received. Here it is is: ask your family physician to request all your records from the different providers. They do not get charged for it. Whether your family doctor charges you is another matter. Also, how is this efficient for the patient and the primary care physician? I prefaced the post that most of the information came from my master’s project. In this project I had a methodology on how I will search, classify, synthesize and communicate the information. While it may seem like I have not used any evidence in this post, I have reported from evidence-informed knowledge. In hindsight, I should have incorporated more of the evidence in the actual post as opposed to simply reporting it. Having said that, I think the best way to “drive-home” a point is through anecdotal examples. Indeed, the law does and I did not state otherwise. It is at the discretion of the custodians that hold your records whether they charge you or not. In my original post, I point out that as a patient requesting to obtain my information, my perception – not reality – is that I do not own my records, because I am being asked to pay to get them. Although “access” from the law’s perspective isn’t the issue, obtaining the records is and hence this creates a barrier that impedes “access” to information. Although I do not have any evidence to back the following claim, I think this barrier to obtaining your records can create more health problems for the patient (e.g. anxiety, frustration). Not only are you managing your life and career, you also have to manage your health. If you’re missing a key piece, how can you complete the puzzel? By law, we have ascertained that everyone has free access to their PHI. The argument then is applicable to custodians of PHI who charge the fee for individuals wishing to obtain their information. I agree that my argument may seem inequitable to patients who do not have a chronic condition. However, there is no evidence for the value of obtaining PHI for healthy patients, versus the value in empowering patients with chronic conditions to better manage their care is evidenced through studies using various types of interventions. The above mentioned claim creates a privacy issue, as the individual with a chronic condition – any one for that matter – would have to disclose their health information. I agree with this statement. In my opinion, it goes to reinforce my belief that our system in Ontario does not revolve around the patient. How do you manage this aspect? I do not know. It would be interesting to see how the flow of information will be designed to deal with this particular issue (NB: explore Privacy by Design). My inclination would be to find the root-source of the information. Where and who in the patient’s circle of care captured this information? Can the patient be qualified – by a clinician – at the point of information capture? How do you systematically enable and ensure that the patient does not perceive or face barriers in obtaining their information? How is this access communicated and implemented across the healthcare continuum without compromising the patient’s privacy? Does the patient care to remain anonymous or not? How do you define “chronic disease”? A good place to start is Ontario’s chronic disease prevention and management framework (see prior blog entry). It does a great job in defining “chronic disease” and thoroughly identifies factors – health determinants – that attribute to chronic diseases in individuals, in addition to presenting a strategy on moving forward. Who then is the arbiter of what constitutes sufficient justification for such free access? What is the threshold of severity? Fantastic questions to which I answer: It depends, as a myriad of questions have to be asked. Who’s point of view are we taking? What are the desired outcomes? What does evidence – quantitative & qualitative – inform us? What is the condition that is being considered? What political/economical forces are at play? I can only speak to populations with rare genetic disorders, as that was the primary focus of my research. It is worthy to note that some people have the propensity to develop certain conditions (family history), however I believe those individuals fall under the education and prevention group, as opposed to individuals with a genetic mutation (verified through genetic testing) who will require ongoing management of their health. What’s the biggest take away? We need to have a discussion – probably many. Will our discussions accomplish anything? Depends on who’s playing in the sandbox. One thing is for certain, something has got to give. Since 2007, Ontario released a revamped framework to manage patients with chronic diseases. The frameworks calls for various aspects of clinical and non-clinical interventions that cover clinicians, allied health professionals, patients and other healthcare providers, to collaboratively help these patients achieve better health outcomes. One of the concepts in enabling healthier outcomes is the notion of access to health – the ability for individuals to attain readily available services they require conveniently. For patients with chronic diseases, a key component for them is to access their personal health information (PHI). This is most true for patients who are afflicted with rare genetic disorders. Patients with rare genetic disorders – or individuals who care for them – become managers of their conditions. This could be due to the fact that there is not enough resources for information due to the disease’s rarity, or lack of infrastructure to support their needs. These patients resort to other types of knowledge sources such as online communities and share the knowledge they have gained from personal experiences. Literature shows that in some cases, individuals rely on said advice more than other resources. In Ontario, legislation allows an individual to request their personal health information from the custodians/stewards of the information. Examples could be your family doctor, your records in the hospital, so on and so forth. Have you tried to request your information? I have. I requested my information from Hamilton Health Sciences (HHS). I was notified that the first 10 pages will cost $20 and $0.25 for every subsequent page. These charges – of coarse – were to offset any printing costs and such. Ownership: The information held by these institutions belong to me. They simply act as stewards/custodians of the information on behalf of the patient. Costs: Yes, it is understandable that someone will have to go out of their way (amidst 100’s of daily requests) to locate my chart, copy the information and mail it – I get that – and this costs money. I asked if the fees can be waived. The answer to that was to speak with a manager. I left the manager a voicemail and got a call from her the following week. After exchanging pleasantries over the phone, she informed me that the fees cannot be waived. I asked about patients with chronic diseases who require their information. She did not budge. My next inquiry was with regards to patients who cannot afford to pay the fee. Her reply was to narrow down the time period of the request, therefore reducing the cost, as they do not discriminate against patients who can and cannot afford to pay for these fees. At that stage, I thanked her and ended our call. What are the messages that this policy sends and what are its implications? Ownership: My perception – not reality – is that I don’t own my information. Having personal health records that tap into hospital systems may potentially solve this issue, but it is not an inclusive solution and will only work if the appropriate policies support it. Having said that, I asked for my information and not copies. Whether they scan or print my information for their own records – technically – shouldn’t matter, however, the patient should not bear the cost of having their own health information with them – with some exceptions that are discussed below. In this case, accessibility is an issue. Costs: Fees associated with obtaining your records create a barrier for individuals who need this information. Only individuals who have enough discretionary income can afford to obtain their records. Based on determinants of health and other studies, the biggest populations with chronic diseases is our growing elderly population and disadvantaged individuals. Technology: I’m a strong advocate for individuals to have personal health records (PHR). However, individuals who do not have access to smart-phones/computers and subsequently their PHR, face yet another barrier. Even in an ideal world where everyone’s records are in a PHR, I.T. is simply an enabler of the solution and should the supporting policy be lacking, then having PHRs is pretty useless – I think. Does every patient require to obtain their information? Probably not, however, it is their right should they wish to do so. Should a healthy patient obtain their information at no cost? I don’t think so. Also, I don’t think healthy patients perceive managing their health as a priority. Sure, they are taking care of themselves and undergoing preventative screening and such, but it would be different in the case of a diabetic v.s. a non-diabetic person. Should every patient with a chronic disease obtain their information at no cost? Absolutely. It is an important step in enabling and empowering them to become an active participant in managing their health. Clearly it is not as simple as black and white. Which types of diseases would classify for free – not costing the patient – access? Given that we are moving towards a more “patient-centric” model, why are there barriers for patients with chronic diseases? I hope this post inspires and opens the doors to explore opportunities and engage in dialogue. As a patient – yes, You – what do You think? **Update: I’ve received some fantastic feedback from subject matter experts, and will incorporate it into this post hopefully by the weekend. Look forward to it!